No Bake Cherry Lemon Cheesecake is the perfect summer dessert. Bright lemon zest is added to the creamy cheesecake which perfectly complements the sweet cherry topping. I love seeing all the different color cherries when I walk through the produce area in my grocery store, then it dawned on me, I do not have a cherry recipe on this blog! My favorite way to enjoy cherries is just snacking on them, but I live with a cheesecake ‘connoseur’ who requested a special cheesecake. It’s warm and humid at the coast here in Los Angeles and I whenever I can avoid turning on the oven, it’s a good day. So, given that I have an outstanding request for a cheesecake, not wanting to heat up the kitchen and that I am clearly in need of a good cherry recipe, a no bake cherry lemon cheesecake was the only solution. Instead of using my round, springform pan for the cheesecake, I decided to change it up and make it in my 5 x 10-inch loaf pan. Now this is a bit of a challenge because the springform allows for easy removal of the cheesecake. So how am I going to get it out of a loaf pan? I lined it with plastic wrap and left some hanging over the sides to act as handles. And it actually worked! If you love cheesecake and you love cherries, I really recommend you making this dessert. It does not disappoint but make sure you have plenty of people to share it with, it is quite a large cheesecake. 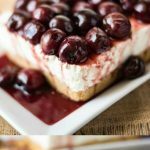 If you’ve tried this No Bake Cherry Lemon Cheesecake or any other recipe on the blog then don’t forget to rate the recipe and let me know how you got on in the comments below. I love to hear from my readers! You can also FOLLOW ME on FACEBOOK, TWITTER, INSTAGRAM and PINTEREST to see daily recipe updates. Line a 10 x 4 inch loaf pan with plastic wrap allowing to drape over the sides. Add crackers to a food processor and pulse until they turn to crumbs. With the processor running, drizzle in the melted butter until combined. Pour the crumbs into the bottom of the loaf pan and press firmly. Freeze for 15 minutes. Add the gelatin to a bowl and mix in boiling water, set aside to cool. Add the cream cheese to a microwave-safe bowl. Microwave for 15 seconds, stir and then again for 10 more seconds until softened. Beat the cream cheese, condensed milk, vanilla and lemon zest until mixed. Add the gelatin and mix until well combined. Pour the cream cheese mix into the loaf pan. Cover with plastic wrap and refrigerate for 2 to 3 hours until set. Add the sugar to a pan over low heat until the sugar is melted. Stir in the cherries and cook until the cherries release their juice, about 4 to 5 minutes. Transfer to a bowl and allow to cool. Remove the cheesecake from the refrigerator and lift out of the pan using the plastic wrap and place on a serving plate. Pour the cherries over the top and serve. I’m so happy for you. I wish I made one today, enjoy! Hi Janette! Somehow changing things up a bit by making them in a different pan etc. can make things taste even better – how is that?! LOVE the idea of this. It really reminds me of something my mum used to make when I was younger. This cheesecake looks amazing! Love cherries!